I started my night off at Rancho again — not a bad way to do it, really. 1977 opened up the night; we actually have their vinyl at home from a Showcho show, but that’s the last time they played the bar. They’re working on a new EP, and they played a lot of the songs during the set. The tunes sound good but the band wasn’t really working their stage presence; I felt like they gelled together musically but didn’t show much chemistry. I wish they’d brought more of the energy of their songs outward. After that set I hopped around the corner to Bread and Circus. The room had a really nice atmosphere, with tables out and votives lit. The stage set-up also makes the venue feel a bit more special, like you’re there to see a play or a cabaret show. It was kind of nice; the transition between bands at the festivals can feel a bit abrupt sometimes but this smoothed it out. The mood of the room also fit Hopeful Monster’s music well. 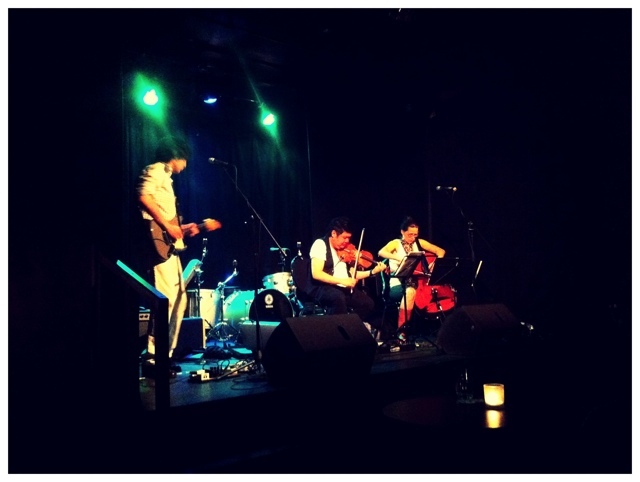 They play as a four-piece, with guitar, violin, cello and piano. Their songs are pretty and could be straightforward but they bring in some interesting arrangements. I probably won’t see anything else like this band during the festival; it was a nice palate cleanser. After that I jarred my system a little by hopping over to The Boat to see Extra Arms. The room was about half full, but didn’t seem as engaged as the B&C audience had been. Extra Arms, from Brooklyn, played a good set though; they reminded me somewhat of an Old World Vulture with lyrics. The lead singer said the show was their first out of the country; hopefully they’ll come back, because I think their sound would do well in Toronto. One thing I hate about The Boat is the really red lighting throughout. It’s hard on the eyes, and it’s terrible for photos. After I left The Boat, I ate two potato taquitos at Salsas. They were delicious. I went back to Rancho, which had a good crowd, to end the night. I was pretty much down for the count by then though. In it to win it for the weekend!